Oops …. Hit a big bump in the road when beginning the wiring instillation for the Silent Hektik 4112 regulator. Fortunately, before wiring up the Silent Hektik regulator purchased well over a year ago, I decided to visit the Silent Hektik WEB site for one last look. Fortunately, while perusing the information on the regulator, a major difference was noticed in a couple of the wiring drawings on the Silent Hektik site which show typical instillations. Thankfully, I had the presence of mind to filter the Silent Hektik WEB pages through a German to English translator. As mentioned in a post well over a year ago (when discussing the problematic Ducati regulator) much to my surprise, the Silent Hektik regulator the DOG Aviation procurement department purchased through a motorcycle shop in England came with wires coming out of the regulator, as opposed to spade leads (which is what I was expecting). As can be seen in the photo below my order was placed for a F-4112 Silent Hektik regulator that has spade leads. I asked the vendor to check with the manufacturer and was told that the only 4112 regulator being made now was the version with the wires and that the part number for the version with the spade leads was changed to F-4118. I didn't notice it at the time but the part number on the regulator I received was R-4112 and not F-4112. Apparently, there were variants of the 4112 regulator prior to the time my order was placed. It is now my understanding that all the 4112 Silent Hektik regulators with wires coming out of the regulator are wired differently …. and as such, NOT what we want to use as a direct plugin replacement for the Ducati regulator in the RV-12. Of course, this prompted another long delay as I decided to just order the new F-4118 regulator from Europe. (Gee, wish I would have caught this issue over the winter months so there would not have been a long delay… oh well). Sure, I could have used the wired regulator by changing the wiring, but should the Silent Hektik regulator fail at some point in the future, I would have to remember one can’t directly plug in the Ducati regulator which I will now have as a spare or use another regulator obtained locally such as a NAPA, John Deere, etc. without making a wiring change as well. Builders beware!!! There is the BIG BIG difference between the wired version of the R-4112 Silent Hektik regulator and the spade connector version of the F-4112. On the standard Ducati regulator reading the terminals from left to right you have G G R +B L C. On the Silent Hektik R-4112 WITH WIRES, the terminals are marked as G G R B- L C. Yet on the F-4112 version of the Silent Hektik regulator with the spade connectors (like the Ducati unit), the terminals are marked as G G R B+ L C.
This is a photo of the F-4112 regulator with the spade leads … it is the direct replacement for the Ducati regulator. Note that the fourth terminal from the left is labeled as … B+ Bat. This is a photo of the R-4112 regulator the DOG Aviation procurement department received from England… however, it is the version that has wires. Note the label shows the fourth wire from the left is labeled as … B- Bat …. Not good. The big difference between the two regulator versions is how the regulator obtains its ground …. The R-4112 unit WITH WIRES gets it ground from the B- Bat lead (blue wire) which needs to be connected to the battery's ground terminal. However, the RV-12 wiring configuration connects that lead to the battery's positive terminal, not good!!! The version of the F-4112 regulator with the spade leads uses the regulator’s case as the ground and the B+ terminal is connected to the battery's positive terminal … as it is for our RV-12 application and therefore the spade connector version of the F-4112 regulator IS a direct replacement for the Ducati regulator. Of note: Because I’m planning on installing the version of the regulator with the spade leads on the newly constructed baffle plate, a ground wire will need to be attached to the case of the regulator which will be run to the grounding block that was installed on the DOG Aviation RV-12's firewall. I’m assuming having two very different versions of the regulator sharing the same base part number must have created quite a bit of confusion. Perhaps it is why Silent Hektik changed the part number to F-4118 for the regulator with the spade terminals … and now the one they recommend on their WEB site as a replacement for the Ducati regulator on Rotax912/914 engines. The new F-4118 regulator IS the one we want to install as the direct plugin replacement for the Ducati regulator. It also has some nice features that will be mentioned below. If you have one of the F-4112 regulators with the spade leads you should be OK, just check that the sticker above the terminals says B+ Bat and NOT B- Bat. Just be sure NOT to use one of the regulators with the wires because it IS NOT pin for pin compatible with the RV-12’s wiring for the Ducati regulator. 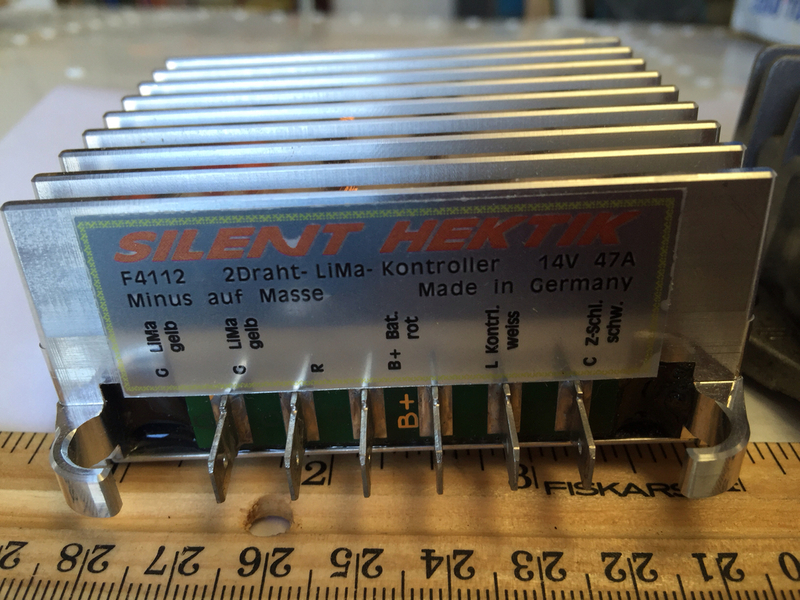 Close-up of the new Silent Hektik F-4118 regulator. As can be seen in the previous photo, the spade leads on the F-4118 regulator are marked as G G R [B+ Bat] L C which is what we want as a direct replacement for the Ducati regulator. The F-4118 regulator also has an added built-in feature of a four stepped voltage output ... so it can be used not only on lead acid batteries, but also on AGM and Ion batteries as well … both of which benefit from the voltage stepping. 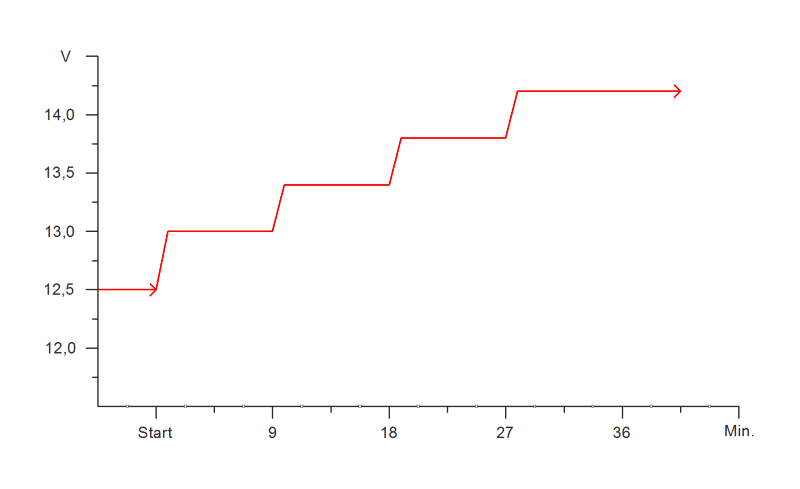 The voltage stepping ranges from 13 to approximately 14.3 volts in four steps spaced at approximately 9 minute intervals. 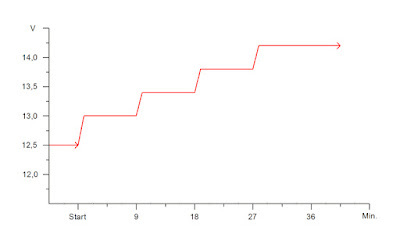 Photo of a charging graph obtained from the Silent Hektik site showing the charging steps for the F-4118 regulator. Also of note, it appears to me the F-4118 regulator seems better suited for an aircraft instillation than the R-4112 regulator … in that, the regulator appears to be sealed much better from the elements. The R-4112 regulator has a seam running around the regulator because it is assembled from two machined aluminum halves which appear to have no gasket or sealant to make the seam water resistant … also, there are exposed tiny threaded screw holes between the fins that are used to mount internal components. The seam and the tiny holes would have required an application of a thin bead of high temp silicone to help make the regulator water resistant. However, the construction of the new Silent Hektik F-4118 regulator is very different … in that, there is no mating seam or threaded mounting holes between the heat sink fins. The F-4118 regulator is beautifully machined from one solid billet of aluminum and the circuitry is inserted into the body of the regulator from the bottom and has an aluminum cover plate which appears to be potted in place … the regulator is seemingly sealed very nicely with potting resin. At first I was a little disappointed that the new F-4118 regulator did not have a smooth flat bottom as there is on the R-4112 regulator (which should offer great heat transfer performance). But with the regulator installed in the lower cowl's air duct, there will be an abundance of cooling air flowing past the regulator’s fins at all times ... so excess heat should never become a performance issue for either regulator. The way the new F-4118 regulator case is made from one piece of aluminum and nicely sealed with potting resin made me quickly forget about having a solid flat bottom on the regulator. The Silent Hektik R-4112 regulator (with wires) on the left and the new F-4118 regulator with spade connections on the right. The new F-4118 regulator is on the right and the R-4112 regulator is on the left. As one can see in the photo, my finger is pointing to the seam resulting from constructing the regulator from two pieces. As can be seen, the F-4118 regulator on the right has no seams or holes protruding the aluminum. The same can not be said for the R-4112 regulator on the left which one can see has at least five or six threaded screw holes between the fins for mounting internal circuitry. View of the bottom of the regulators. The new F-4118 regulator on the right has the control circuitry inserted from the bottom and sealed with a potting resin. The R-4112 regulator on the left has a nice flat bottom which I would prefer … however, the fact there are no screw holes between the fins or seams on the body of F-4118 regulator coupled with a nicely sealed potted base scores more points in my book for an aircraft instillation. The next post will cover working out some of the wiring details and dilemmas … plus, the changes that needed to be made when it was discovered the wired version of the R-4112 regulator would create issues.